Choosing your car while Road Tripping in the Outback! Driving in Australia is an experience to be savoured! It is a way to experience the wide-open spaces and magnificent natural scenery, and there are so many destinations that can only be experienced by car. Before setting off you should make sure you are well prepared for the Australian driving experience. So what car do I take for driving in the outback?! Having a well-prepared vehicle is more important than the question “what car to take”. If you are going to hire a vehicle, you might need a four-wheel-drive (4WD) when you want to drive on unsealed roads. Most, if not all car hire companies don’t allow you to drive on unsealed roads with a conventional car or camp mobile. But as proper 4WDs are just more robust, you don’t need to worry that your car is falling apart on a rough track. How do I prepare my car for the outback?If you hire a car you should check if it has a tool kit. When you’re in doubt, ask in a garage for advice. You should carry a high-jack, a wheel spanner and a ground plate (to adjust the high-jack on soft ground) when you have to change a flat tyre. Other useful tools include insulating tape, lubricating spray, set of screwdrivers, shovel, some ring and open spanners, wire. Make sure the vehicle is in good technical condition. Check the tyres and the spare tyre before you go. Don’t forget the manual. Take some essential spare parts and tools with you. Even if you don’t know how to use them, the friendly guy in the car passing by probably can help you if you have the right spare parts. Bring spare parts including engine oil, fan belt, set of hoses, radiator hoses, spare bulbs, spare fuses. We usually go to a car dealer, buy the essentials, and arrange with them that we can bring the spare parts back if we don’t need them. If your car breaks down, don’t be a fool and try to walk somewhere to get help unless you know this help is just around the corner. Perhaps you have to wait a few hours, or even a day, until another car comes by. But if you have enough water you are safe. Don’t panic! And never leave your car! 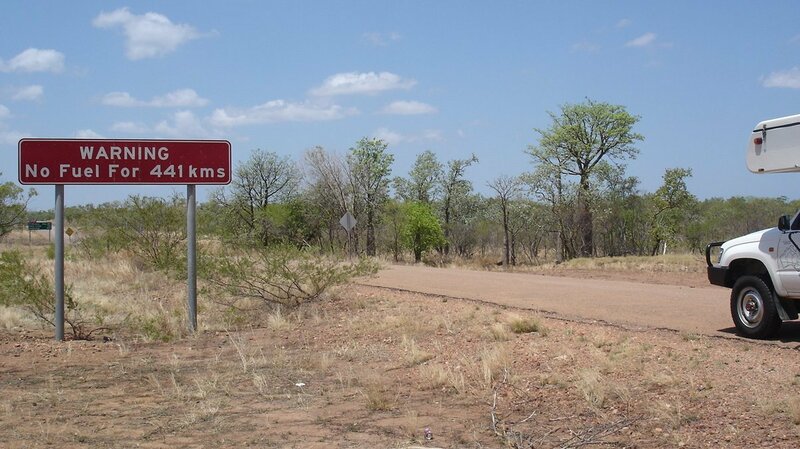 People perished in the Australian Outback because they didn’t obey this most important rule. Last big thing is: What car to take?! Any robust car in perfect technical condition with reasonable ground clearance. That’s the secret! The Toyota bushcamper is a great vehicle for Outback driving. It offers room for two people, has a gas stove, kitchen sink, water tanks, a fridge, and much storage. The two 90 l fuel tanks give you some freedom in remote areas, but it is wise to re-fuel when you get the chance. The bushcamper has also a huge water tank for the kitchen sink. We never count this when we calculate the amount of drinking water we need, but it gives extra security. The bushcamper makes Outback driving truly comfortable, as long as you are fit enough to climb into the top bed. But, there are many vehicles that can do the trip, so it’s all up to you! One more tip. If you’re in a road service club in your home country, take your membership ID with you, just in case you need a towing service back of beyond. They might accept your home membership. This can save you money. Please note: If you plan an expedition-like trip into remote and rough areas, for example the Canning Stock Route, you certainly need to do a bit more to prepare your car accordingly.